The exhibition ‘Tell It Like It Is’ features Seán Hannan's newest body of work created during a 3-month residency at Residency Unlimited. Taking the city of New York and its vibrant rap music scene as a starting point, this collaborative artwork marks Hannan’s first solo exhibition in the US. 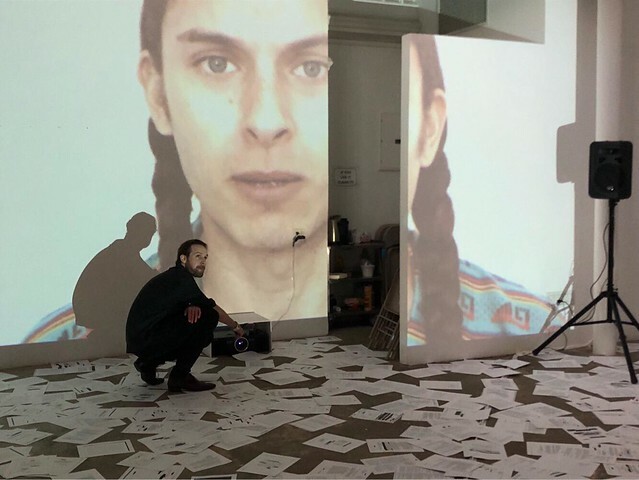 ‘Tell It Like It Is’ is a three channel video installation that puts the visual and the preforming arts vis a vis through a rap music performance and video installation. Rap music, in its many contemporary iterations, is a popular musical style that originates from the streets of New York. The stories conveyed through these musical lyrics often tell the truth other media will not. Rap music frequently seeks to expose existing oppression and hidden power structures that affect our perception of class, race and our society at large. Hannan sat down with three rap artists from New York and New Jersey, (Money Marx, Rae Renegade and Bobby Sanchez) to talk about the role that information, truth-telling and conspiracy theories play in their lives and music. He asked them, “how does the information we consume- both published and leaked- relate to the way we perceive the world around us?" Based on these conversations, the participating rap artists were presented with leaked and classified documents found online about a variety of current affairs. Hannan asked the rappers to reflect on the information provided to create an original rap song, to be recorded, produced and finally translated into a rap music video in a collaborative effort. ‘Tell It Like It Is’ combines all three songs and videos with web found footage and images taken in New York City. It depicts three rappers’ opinions and convictions about life through their music in a time of fake news, information saturation and high political tensions. Recent solo and group exhibitions include: 2017 , ‘A Minor State of Flux’, Arti et Amicitiae, Amsterdam; 2016, THÈ TRE DE L’ABSURDE (PREQUEL), Galerie Gabriel Rolt, Amsterdam; ‘Unfair Amsterdam’, Art fair in “de Zuiveringshal – Westergasfabriek’, Amsterdam; Jan van Eyck Academie, ‘In Search of… Peripheral Practices’, Academieplein 1, Maastricht (Netherlands); Museum Flehite, ‘In the Face of History’ – Part II – ‘De Context’, Westsingel 50, Amersfoort (Netherlands); Christie’s, ‘Unfair Fundraiser Auction’, Amsterdam. This project is made possible with the generous support from Het Mondriaan Fonds, Amsterdams Fonds voor de Kunst, and Stichting Niemeijer Fonds.